Welcome to my home page for the friends of Acacias and all people interested in these and related trees and shrubs and their worldwide distribution. It is organized by continent and country and will be detailed further as necessary. Ultimately there should be at least one page with the respective pictures from each of the nearly 1.400 species of Acacia s.l..
Main features are a Search Function as well as a list of all described species of Acacia s.l. in the new Genera Acacia, Vachellia, Senegalia, Mariosousa and Acaciella. In August 2011 the long discussion on the split of the genus Acacia into five new genera has been ended (see: http://www.scienceinpublic.com.au/media-releases/the-acacia-debate). I have adjusted my website by renaming the species according to the new taxonomy as they have been published. New combinations in the genera Senegalia and Vachellia as well as Mariosousa have already been published by Seigler, Ebinger and Miller. The American species in this website have been changed accordingly. The book from Maria de Lourdes Rico-Arce treats the American species as a single Genus with the exception of Acaciella, which she had revised in 2006. 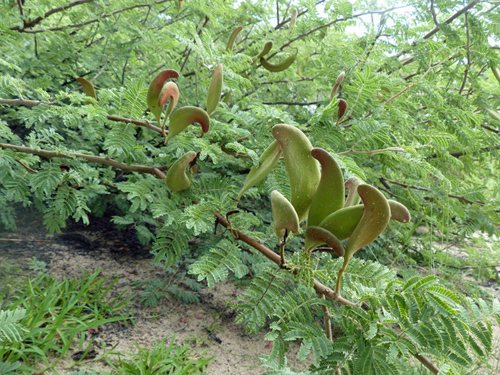 Kodela and Wilson described the new combinations in the Genus Vachellia from Australia. The renaming of the outstanding species from Africa was performed in 2013 and the work for Asia is under way and will be published soon. The new taxonomy is used in the list Species A-Z. My main interest covers Southern Africa and the United States of America. Anyhow, I will only be able to contribute pictures for some of the many species. Readers and persons interested in Acacias may send me their pictures of Acacia (plant in natural habitat; bark, flower, pods, leaves, thorns etc.) by e-mail or CD and I will include them in my website as possible. In 2003 the wonderful website World Wide Wattle was published. There you can find tons of good info on Acacia, especially the Australian species. A key to identify Vachellia-, Acaciella- and Mariosousa-species is accessible here. Most Acacia species in Australia belong to the Sections Acacia (formerly ssp. Phyllodineae), Juliflorae and Plurinerves. This website is not commercial. All pictures, however, fall under the author`s copyright - if not mentioned otherwise - and may not be used further without special permission. Links to other sites have been made without commercial aspects in mind. Due to the search function I have minimized internal links. Eine Haftung für die Richtigkeit der Veröffentlichungen und Links kann nicht übernommen werden. Ich bin nicht verantwortlich für die Inhalte externer Internet-Seiten.